Eating out in Stratford-upon-Avon can be hard on the nerves. You either get over-priced fast food places with Bard-related names (I wonder if the Titus Andronicus spare rib joint would catch on …), soulless pubs with faux beams, or over-priced restaurants with ideas way above the chef’s talents. And you often end up bolting your food so you don’t miss curtain up. So Loxley’s in Sheep Street is one to remember for the future. It’s close enough to the Royal Shakespeare Theatre’s HQ to cater for the theatre-goers – and that’s about the first question the friendly staff ask you, mindful of kick-off times. Don’t expect a vegetarian extravaganza, though – and we’ve got yet another kitchen that thinks Parmesan is veggie. It’s not an absolute deal-breaker for one half of your blog team (who is usually, ironically, ultra-fussy on small print). The other half of the team asked for the dish in question to be served without it, which was done without drama or raised eyebrows. Loxley’s isn’t especially cheap (main courses come in at about late teens and early 20s), but the pre-theatre set menu (£13.95 for two courses and £16.95 for three) turned out to be decent value. There were two vegetarian choices among the starters. The heritage tomato and goat’s cheese salad, served with basil and balsamic vinegar, was perfect – zingy tomatoes that tasted like they’d just wandered in from the garden, paired with a sharp, creamy cheese. Anth confirmed that the soup (the tomato the waitress had told us about turned out to be confusingly disguised as pea – fortunately with no ham in) was good. It came with two hefty chunks of toasted bread. 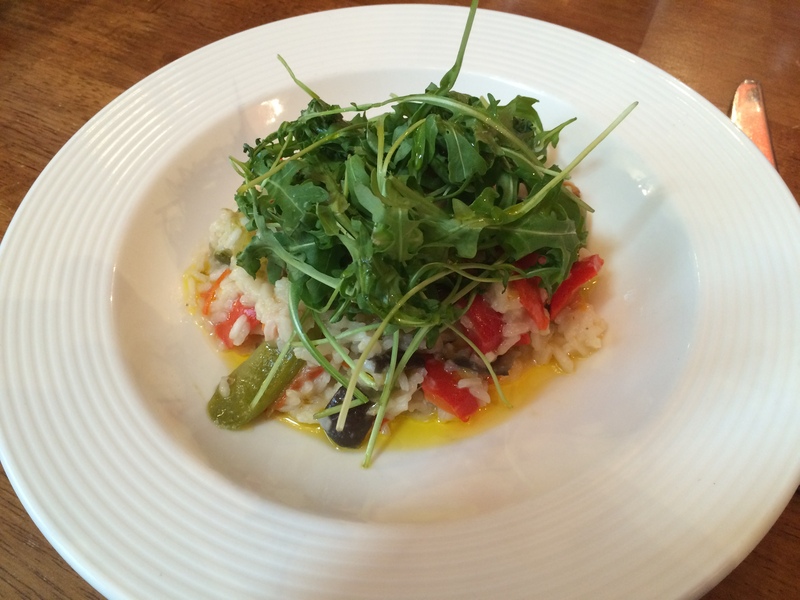 The single veggie main course was that restaurant stalwart – Mediterranean vegetable risotto. At least there wasn’t a squash or sun-dried tomato in sight. It came buried under a herb patch of rocket and, although a touch on the bland side, certainly wasn’t terrible. Some better stock would have elevated it no end. By the look of the main menu, the Mediterranean vegetables appear in a supporting role with polenta. Loxley’s isn’t a world-shattering find for vegetarians, but it’s pleasant, friendly and convenient – and not everywhere in Stratford can say that. When you have a food blog, people assume you can recommend good restaurants and cafes with ease. Not necessarily, given the challenges of finding vegetarian and vegan food on menus that doesn’t involve butternut squash, sun-dried tomato or goat’s cheese. Which explains why I’ll happily choose Indian food as a default setting, rather than stare forlornly at another half-arsed attempt from a can’t be arsed chef. But when a friend asked for ideas for where she and her husband could take visitors from India, my usual fallback was looking rather like a busman’s holiday. So, being terribly self-sacrificing, we agreed to try out some of the quirkier places in Cheltenham. The town suffers from a surfeit of vaguely posh hotels with ideas above their station and not much in the way of decent veggie food. There’s a Raymond Blanc, which I found to be thoroughly underwhelming – a small square of still frozen bland lasagne. Oh, yum. The Storyteller is rather a gem, though. It’s on the edge of the town centre, but right next to a big car park. The website describes the food as Tex-Mex and BBQ grill, and at lunchtime you can get three courses for £12.50. It’s a bright, conservatory sort of building, with art on the walls. Service was friendly and efficient. The menu’s not over-burdened with veggie choice (and you’ll be going hungry if you’re vegan). But what’s there is a bit different. 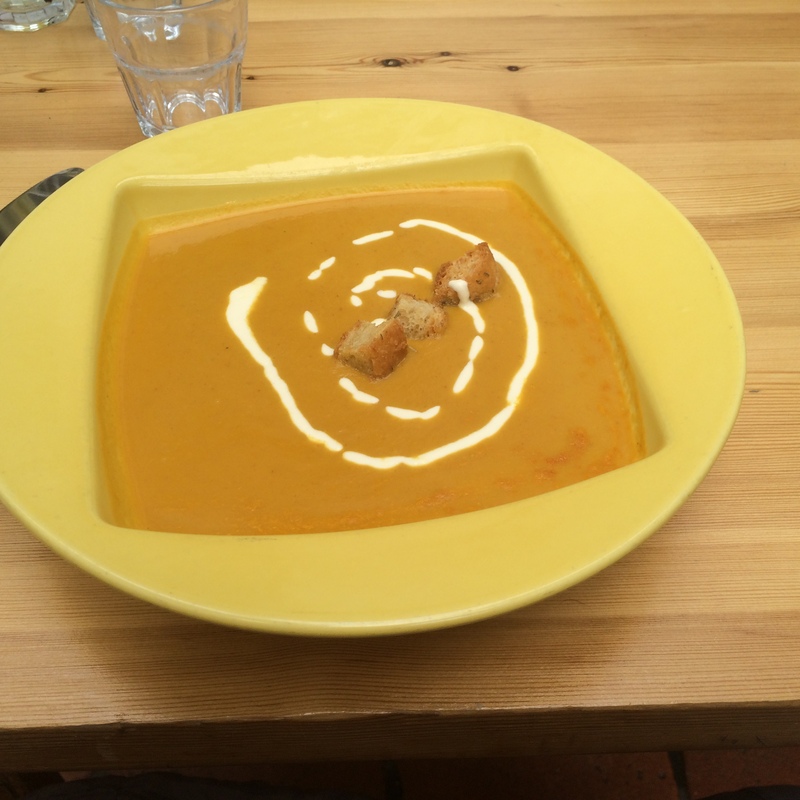 The lunch menu offered sweet potato and butternut squash soup that was smooth, perfectly spiced and dotted with herby croutons. 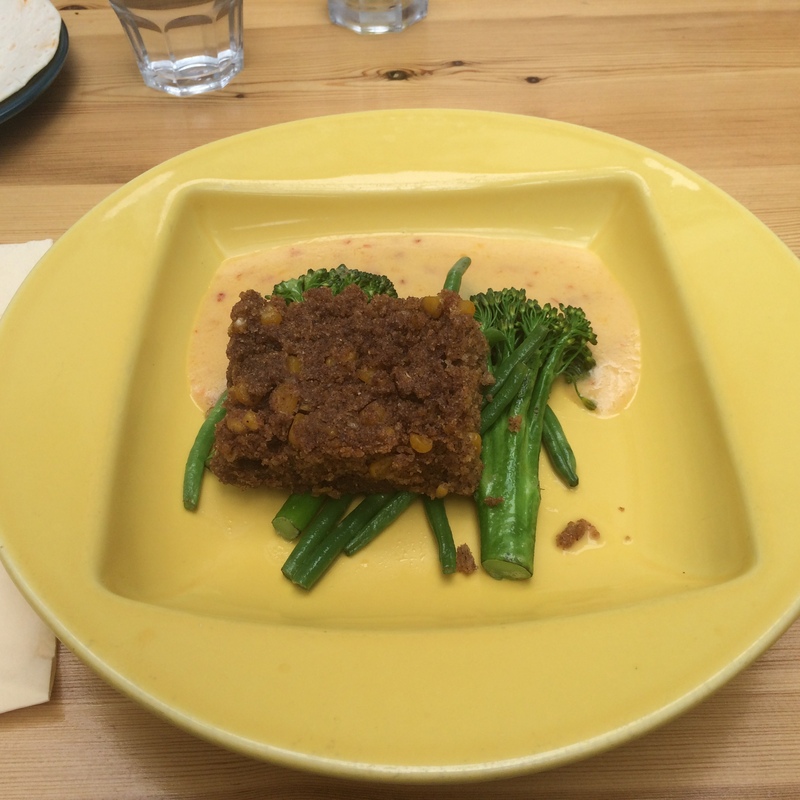 And the main course was rather intriguing – cinnamon cornbread with green vegetables and a cheese and chilli sauce. As one of my friends said, you wouldn’t want to eat it for every meal, but it was, again, immaculately spiced and the vegetables cooked to perfection. We’ll overlook the fact that the bread had the consistency of a faintly crumbly fruitcake! The chocolate torte, which I didn’t need but wanted, was divine – smooth, rich and not over-sweet. The lunch special (four choices for each course) included chicken fajita, and lamb enchilada the day we visited – and I always wonder how difficult it would be to offer vegetarian or vegan options of both of those. I think most of us have a restaurant they have heard about and think would be good to visit, but never actually end up going there. For my friend, Jaz and I it was the Eritrean restaurant at the end of her road. We’ve been talking about going to it for years without ever even trying to make a date, but recently the stars aligned and we finally made it there. There being Adulis on Brixton Rd, near The Oval tube station. It was worth the wait and anticipation. The first I want to know as a veg*n diner is what the veggie selection is like. Adulis has a great vegetarian selection at starter, main and set meal sections of the menu. We skipped starters and went for the set platter – the Naitsom Special – a selection of vegetarian dishes served on a large, round platter lined with injera, the half-pancake, half-bread staple of Eritrea. This was a wise choice in terms of how much food we could eat, but it did mean we had quite a wait before the food arrived. The food arrived arranged into little piles on a platter of injera with a basket of injera to accompany it. You don’t use cutlery, you tear off a piece of injera and use it to pick up morsels of food. This is not a place for the carb-phobic, you end up eating a lot of injera this way, which is probably why my friend and I got nowhere near finishing it all. The selection of dishes is a good mix of hot and cold in temperature and spice level. Some a pure vegetable and some a mixture of pulses. Standout dishes for me were the yellow split pea stew, the okra (and I don’t normally like okra) and the lentils. There wasn’t a taste or texture I disliked there. We finished with the coffee ceremony, where coffee is brought to your table in a traditional ceramic pot and served alongside popcorn and frankincense burning on a little brazier. And stuff freshly ground coffee, these beans are freshly roasted in a corner of the restaurant so everyone gets to enjoy the smell. The food was great and so was the atmosphere. This was a mid-week evening and the restaurant was full, so I recommend that you book ahead. The service was on the leisurely side, but came with a genuine friendliness and care for the diner that is all too rare and completely charmed me. The price for the two of us, including drinks, came to £52. I am pleased to have found another veggie-friendly restaurant and cuisine. I will be going back and I won’t be waiting years to do it. If you stood outside The Firestation Bar and Restaurant on Waterloo Rd, as a vegetarian, you’d hesitate to go in. There’s a distinct smell of cooking meat coming from it. I’m not so sure that it is actually the meat cooking that you can smell, but they fry their chips in beef dripping and I think that’s the aroma that greets you on the street. That’s not all that greets you on the street, the noise from the busy bar spills over as well. It doesn’t seem to be a promising place for a nice veggie meal, but appearances can be deceptive. The first room you come to inside is the bar. I’ve never seen it less than packed and noisy either with commuters stopping for a drink before getting the train home or for theatre goers (the Old and Young Vic are nearby). Behind the bar is the restaurant. This is much quieter, thankfully. It’s a big space, even more so with the height from the firestation it used to be. There are nice touches with the tiled walls and fire buckets around that are reminders of its former life. Service was prompt and friendly without having the waiters hovering over us. You can’t get away from the the fact that meat features heavily in the menu, but there are three veggie starters and two main courses. And, while the starters involve cheese, neither of the mains do!!! I know, someone who thinks you can feed vegetarians without shoving big lumps of cheese at them – it’s almost unheard of! I had the Heritage Tomato on Roasted Garlic Foccacia as my starter. This was a bit underwhelming. For a start it came hidden under a big pile of undressed rocket leaves. Now I’m as big a fan of green leafy vegetables as you’re likely to find, but both courses had this foliage. A garnish I can understand, but this was like a small greengrocers’ stall had been upended over the plate. I had to move it aside to be able to take a picture. I couldn’t really taste the garlic in the foccacia and while there was a decent selection of different varieties of tomato they were served raw and fridge cold so there was no differentiation in flavour to be descerned. Cold tomatoes on toast with a light sprinkling of crumbled goats cheese. Not brilliant. The main course made up for it. I went for the potato gnocchi with sunblush tomatoes and roasted artichokes. This came with the rocket haystack, but at least it was mentioned on the menu and the leaves wilted and became one with the rest of the food. This is a dish with gutsy flavours. The sunblush tomatoes dominate, but the artichokes stand up to them and then there’s the creamy bite of the pan-fried gnocchi to add a solid background. It’s a great dish and proves that you don’t need to have a solid lump of protein in a meal for it to be satisfying. So, a bit of a mixed bag, really, but worth a another visit at least.